When you keep stalling your motorcycle, it’s annoying and frustrating. Add to that a large portion of humiliation when you stall as you attempt to move off at lights with a queue of traffic behind you. Detailed on this page are some tips to help stop stalling your motorcycle. You will overcome it, but it does require patience and practice. To start off, check that your motorcycles clutch cable is correctly adjusted. Over time and with regular use, the clutch cable may need to be tightened to reduce the amount of play. If the cable is slack, you may be required to pull the clutch lever in more than is necessary before the clutch begins to operate. Depending on your motorcycle, this is usually an easy process of adjusting lock nuts. It’s important to ensure your bike is well maintained, but when it comes to clutch’s, it’s also necessary to understand that each and every clutch is different. 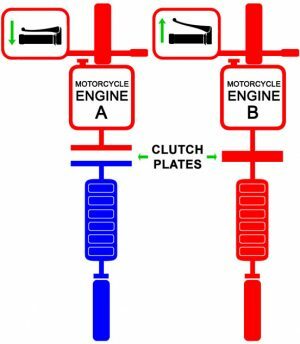 Each and every clutch operates slightly differently depending on how much wear it has undergone, whether it has been used aggressively, plus the make and model of the motorcycle all make a difference. The clutch isn’t a on and off switch. If you have no understanding on how it works, it may prove beneficial if you have a basic understanding. As can be seen in the simplified diagram, the clutch separates the engine (which is always rotating – engine A) from the rear wheel when the lever is fully pulled in. When you release the clutch, two plates join together by use of friction and pressure to complete the ‘circuit’ between the engine and the rear wheel (engine B). Power is sent to the rear wheel and it will begin to rotate. The engine is rotating at speed, even on tick over, so the process of getting the rear wheel up to the same speed as the engine must be gradual. If you release the clutch too quickly, the rear wheel will not gain in speed sufficiently to match that of the engine and a stall will occur. As the clutch plates begin to come together, this is known as the bite point or the friction zone. 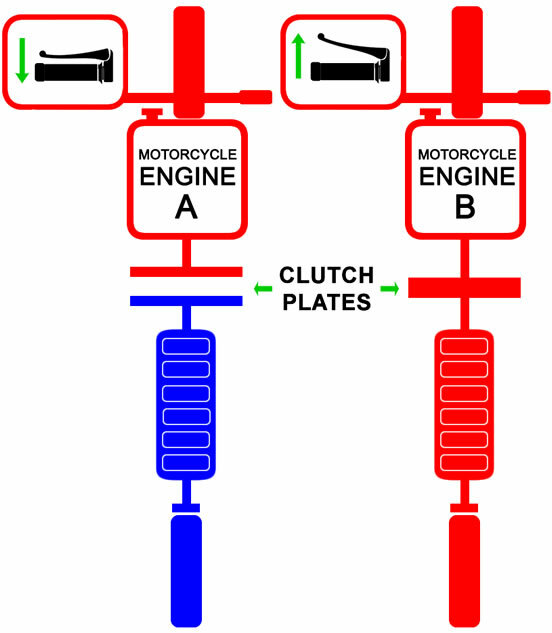 This is the point at which the release of the clutch lever must be gradual else a stall occurs. Working the clutch lever anywhere leading up to, or after the bite point / friction zone can be made as quickly as you like as this will not result in a stall. Locate a flat, level surface in a quiet area that is reasonably clear of debris. Ensure your machine is in neutral and start the engine. Remove the bike from its stand and straddle the motorcycle. You can move off on your motorcycle with the throttle totally closed. The engine on tick over will provide enough torque (power and speed) to pull away with no additional throttle utilised by the rider. Squeeze in the clutch fully and select 1st gear. Now very slowly begin to release the clutch until the bike slowly starts to move. This is the bite point / friction zone. As the bike slowly gains in speed, pull in the clutch, apply the front brake and repeat until you feel confident where the friction zone is located. Now with the motorcycle still in 1st gear, try releasing the clutch faster until you reach the bite point / friction zone location where you will need to release the lever much slower. Keep repeating this process. Using the same technique as above, this time as you enter the friction zone and the bike begins to roll, apply a little throttle. As you pass the friction zone, fully release the clutch lever. The above technique should be practiced until proficient. If you want to move off a little quicker though, you’ll need some throttle. Now try the same technique as above, except progressively increase the throttle at the same time as you release the clutch from fully squeezed in. If you have a rev counter, around 1500-2000 RPM should be fine by the time you hit the friction zone. This will provide more power so that you can now practice releasing the clutch at the fiction zone area a little quicker, resulting in a faster move off. Be careful though, too much throttle combined with a quick release of the clutch may result in launching forward very quickly which may render you unstable. Using this method, the clutch lever effectively becomes the throttle by determining how fast you will move off. Stalling at traffic lights can be annoying. Whilst waiting at traffic lights, hold the clutch around the biting point / friction zone area. Holding in this area using small hand movements to engage and disengage the clutch will help to prevent stalling and gain experience with clutch control. When the lights change, slowly release the clutch and as you begin to roll, apply gas.